The King had already been married once, and had by his first wife, seven children, six boys and a girl, whom he loved better than anything else in the world. As he now feared that the step-mother might not treat them well, and even do them some injury, he took them to a lonely castle which stood in the midst of a forest. It lay so concealed, and the way was so difficult to find that he himself would not have found it, if a wise woman had not given him a ball of yarn with wonderful properties. When he threw it down before him, it unrolled itself and showed him his path. The King, however, went so frequently away to his dear children that the Queen observed his absence; she was curious and wanted to know what he did when he was quite alone in the forest. She gave a great deal of money to his servants, and they betrayed the secret to her, and told her likewise of the ball which alone could point out the way. And now she knew no rest until she had learnt where the King kept the ball of yarn, and then she made little shirts of white silk, and as she had learnt the art of witchcraft from her mother, she sewed a charm inside them. And once when the King had ridden forth to hunt, she took the little shirts and went into the forest, and the ball showed her the way. The children, who saw from a distance that some one was approaching, thought that their dear father was coming to them, and full of joy, ran to meet him. Then she threw one of the little shirts over each of them, and no sooner had the shirts touched their bodies than they were changed into swans, and flew away over the forest. The Queen went home quite delighted, and thought she had got rid of her step-children, but the girl had not run out with her brothers, and the Queen knew nothing about her. Next day the King went to visit his children, but he found no one but the little girl. "Where are thy brothers?" asked the King. "Alas, dear father," she answered, "they have gone away and left me alone!" 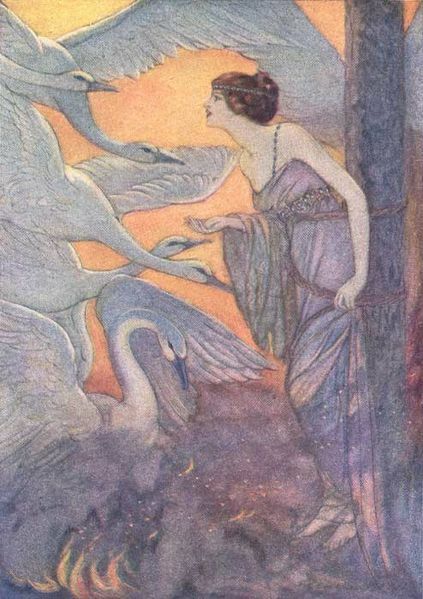 and she told him that she had seen from her little window how her brothers had flown away over the forest in the shape of swans, and she showed him the feathers, which they had let fall in the courtyard, and which she had picked up. The King mourned, but he did not think that the Queen had done this wicked deed, and as he feared that the girl would also be stolen away from him, he wanted to take her away with him. But she was afraid of her step-mother, and entreated the King to let her stay just this one night more in the forest castle. Add The Six Swans to your own personal library.